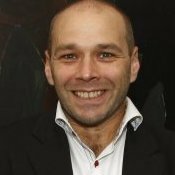 For those who don't know me, (Gary Istok) I wrote a 2800 page Unofficial LEGO Sets/Parts Collectors Guide on 20th Century LEGO. I am trying to document and provide images for all the language variation train sets for the blue track and gray track sets, also early 9V sets. This would include British LEGO (UK, Ireland, Australia), continental Europe, and USA and Canada Samsonite versions of the 1960s, and (no USA trains in the 70s) just Samsonite of Canada in the 1970s, as well as other language stickers on some of the sets in the blue track era of the 1970s. For example for the 182 Train Set, I have images for Canada, and several EU countries. 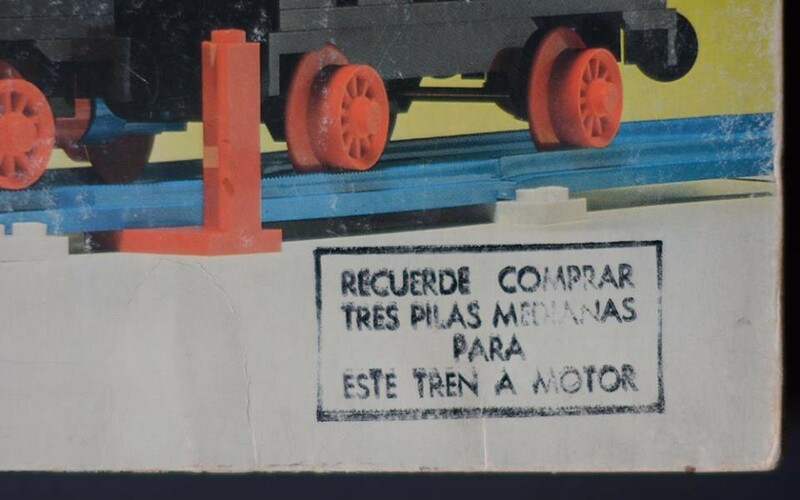 I even received a 183 train image of that set that was sold in Argentina with Spanish stickers on it. But I'm also looking for the 3 language gray track set images as seen above and below for the gray track era sets. I realize that the smaller sets and parts packs can have from 8 to 12 languages on the box, but I'm especially interested in images in the 1-3 language larger set boxes. All online guides only show a Generic image of all the train sets, but I have been updating my guide with images of all the different language variations. Anyway, if anyone has any LEGO train images they would like to contribute, I would give you credit in my collectors guide (a 668MB computer desktop guide, with over 7000 images). In several months it will be expanding from 2800 pages up to 3700 pages, with all updates free to current owners. If you have any images please send me a PM or an Email! Thank you, Vielen Dank, Grazie, Merci! 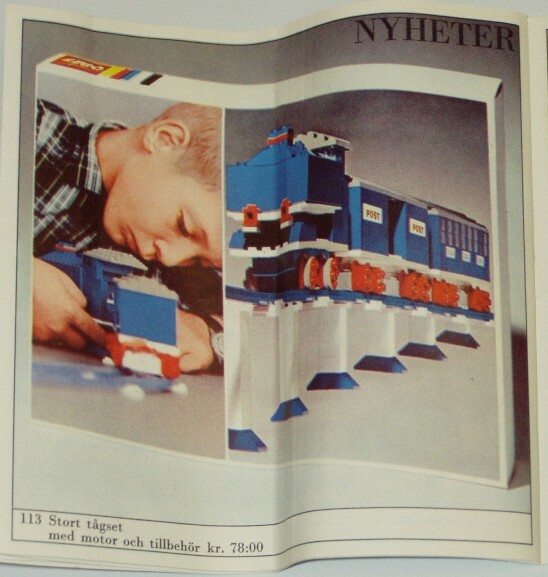 When LEGO trains were introduced in mid 1966, for some odd reason LEGO Sweden decided to have a special "sampler set" available to retailers in Sweden for customers to try out the new Train System. In years of trying to find out if any other countries came out with anything similar to this, the answer seems to be NO. But I'm always on the lookout for this type of unique rare items that other countries may have produced. Here are the parts that came in this box... just train wheels... that short lived and bizarre looking 4x7 4 axle brick and a pair of straight and curved rails, along with 2 sleepers (2x8 plates). 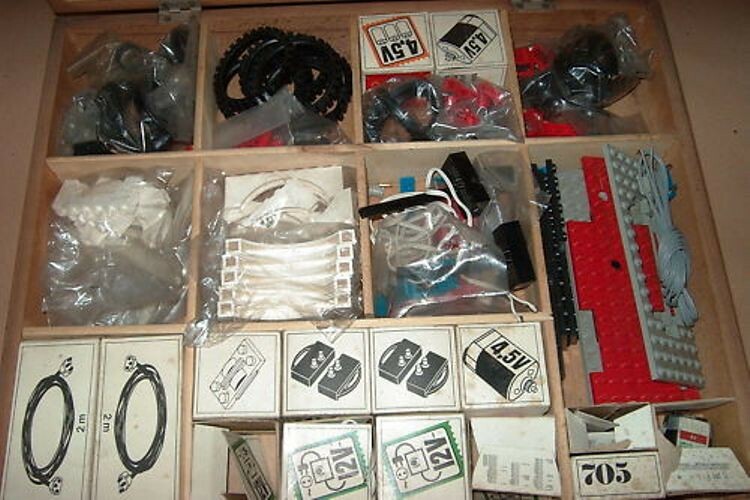 Just enough parts for the customers to play around with and eventually entice them to buy the first LEGO trains in the summer of 1966. 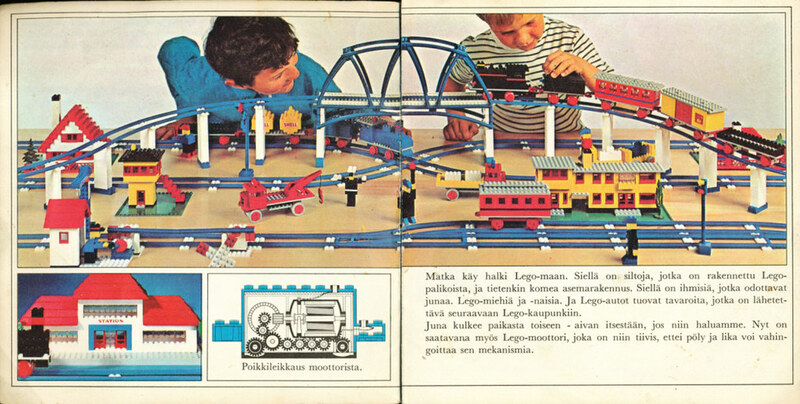 This train brochure was available in most all European languages, and also available in the USA/Canada, at LEGO retailers everywhere. 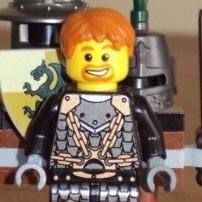 LEGO Historian: I am a huge fan of your work, and love your posts. Now you are posting on a topic very near and dear to my heart: Trains! Please keep the info coming, as I eagerly await your next post. Thanks so much Murdoch17!! I didn't make you wait long... did I? One of the benefits of sharing MY information is that I learn from so many others. LEGO is a vast puzzle... and I'm still finding pieces under the proverbial sofa! 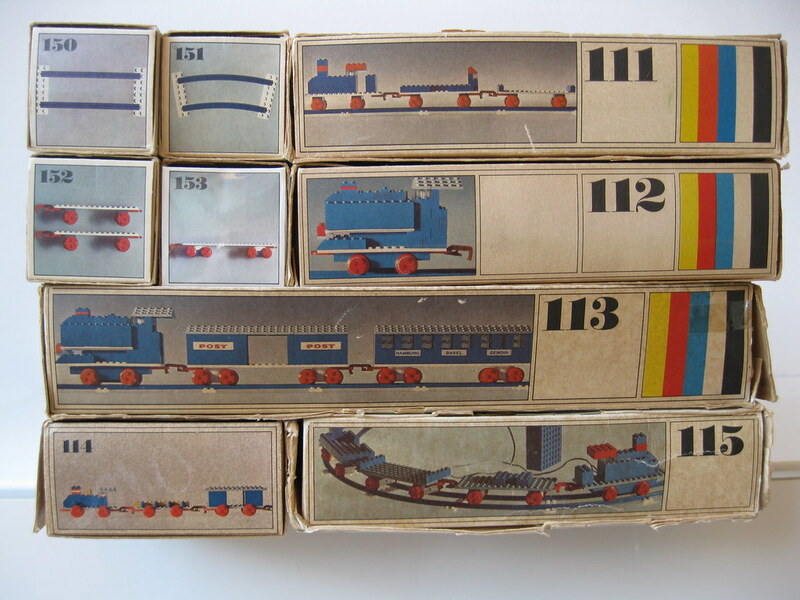 The 1970s blue track era trains were basically identical, apparently all produced in Denmark, with the major difference being the stickers or ink stamps or both. Here is a Canadian 182 Train Set with Signal of 1975. This set has a large Samsonite of Canada bilingual sticker on it. 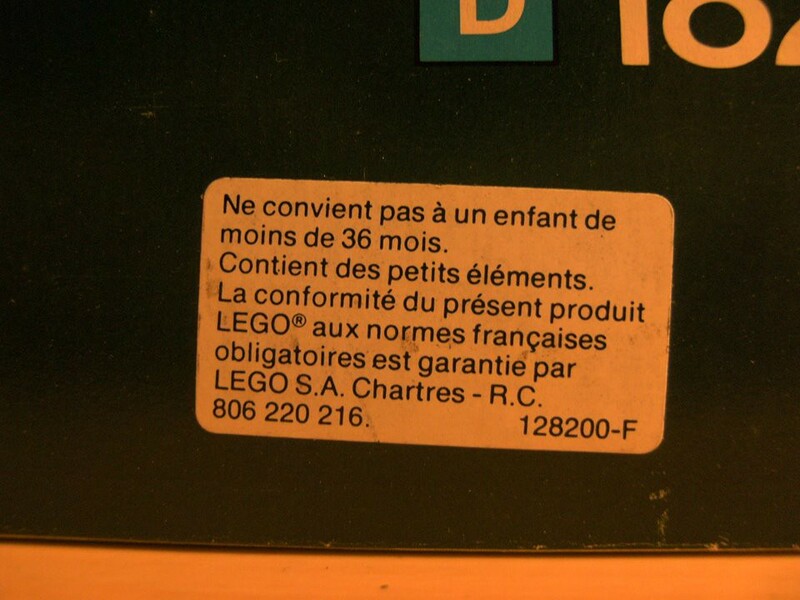 Also... these sets appear to have another label (the first label mentions that it's a motorized set and needs batteries) and this 2nd label on the French set mentions the age group that could play with this set. I believe this says that the parts in this set are not suitable for children under 36 months old. That's odd for 2 reasons... it gives what appears to be a chocking hazard warning in months. The age determination for this set (not for children under so or so years) is seen on the side of the box.... "D" is the highest age range for more mature children who have LEGO expertise. And here is the LEGO catalog age determinator.... letters A, B, C and D, as found on each LEGO box for a brief time in the 1970s. 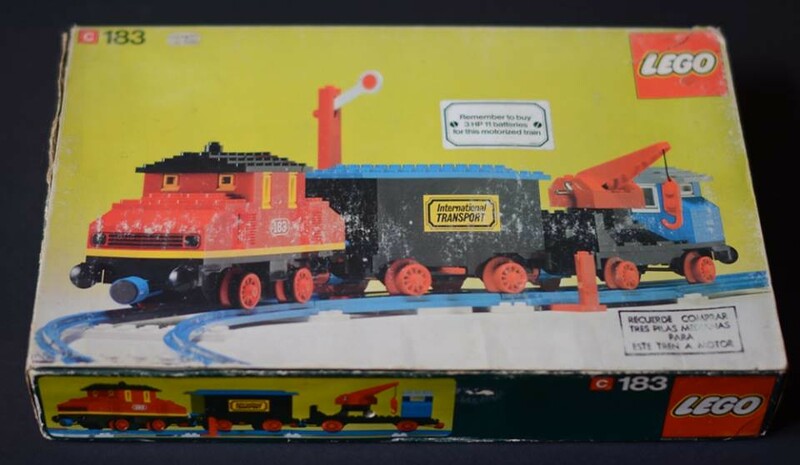 This 1976 set... the 183 Train Set with Signal. 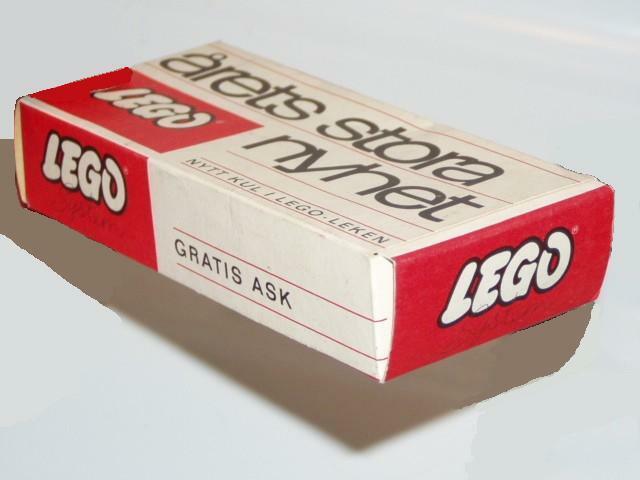 This set has a very interesting pedigree.... the box (like all the boxes of this era) came from Denmark. But the stamps on the box are an English rectangular sticker, and a Spanish stamp. The strange thing about this set is that it could not have originated from North America (after being made in Denmark). None of the blue train track trains were sold in the 1970s in the USA, and the 183 was not sold in Canada. So this import from Denmark (with a sticker usually put onto Canadian sets)... was exported to Argentina, where an additional Spanish language stamp was added to the front of the box. 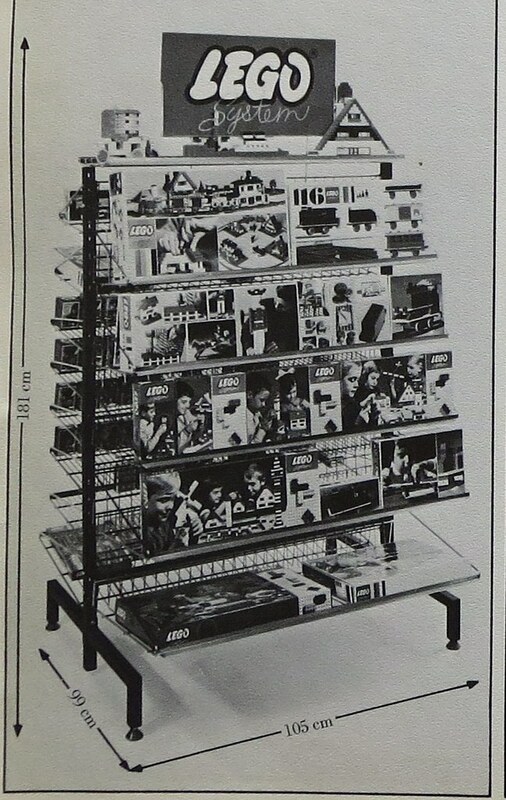 The strange thing is that no LEGO sets were supposed to have been sold in South America before the 1980s. 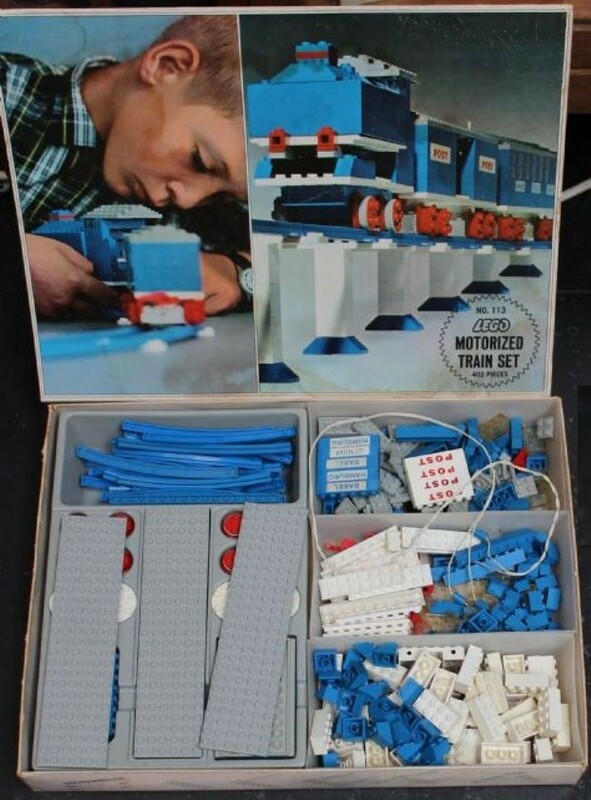 So the existence of this set was quite a surprise to me... which begs the question... what other LEGO sets were sold in South America in the 1970s?? Also, I'm looking for other 1970s sets that have these kinds of stickers and stamps. Wow. So much interesting information! I didn't know they'd ever sold sets completely assembled like that. I wonder how they did that back then. Very interesting. I vaguely remember blue tracks and red hook couplers. 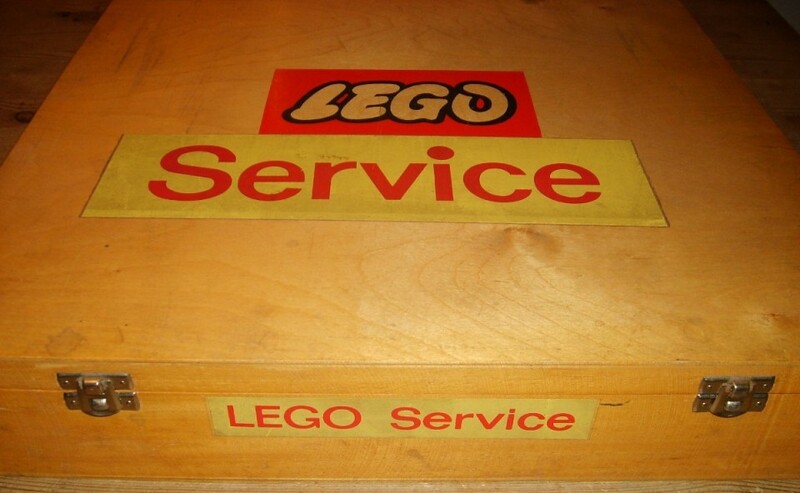 All my earliest LEGO disappeared in a move. I still have my 7710 box. It's the first set I bought after moving out. Thanks guys! Jodawill... now I have to figure out how many sets were prebuilt like that! Actually the battery pack could be purchased built into a train tender car. It was available in the service pack section of the store, or as mail-order. 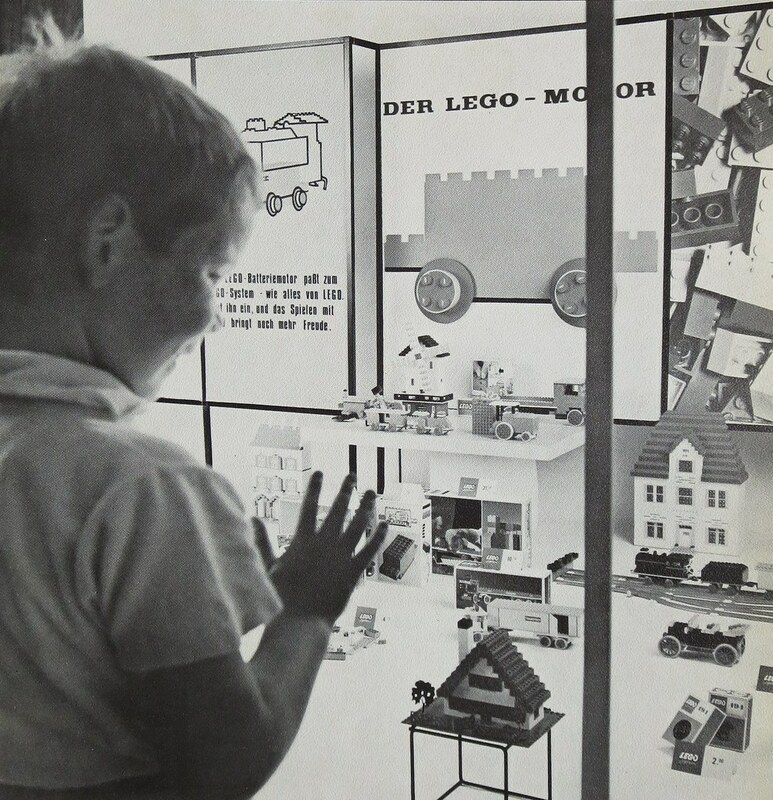 LEGO used to have retailer binders that all the independent toy store owners would get from TLG (by 1961 there were over 11,000 independent toy stores in Europe that sold LEGO). 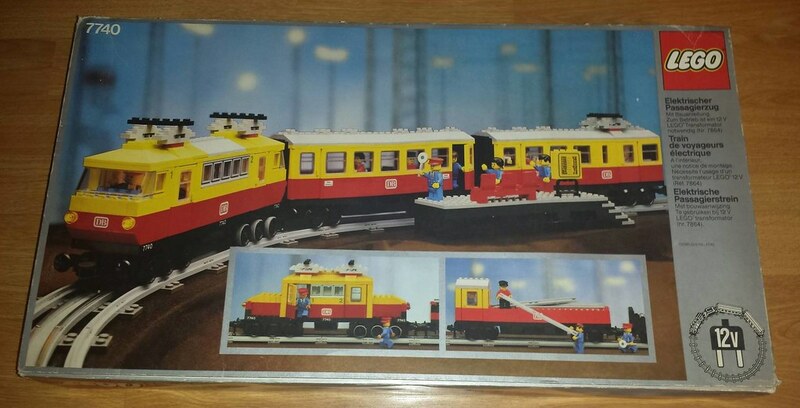 So LEGO Trains were the first successful "System" after Town.... and evolved into the 12V electric trains by 1969, and eventually the current 9V trains by the early 1990s. But in the 1960s, it was just the 4.5V battery powered trains, as well as simpler push trains. That train track display (with points) on the right side of the previous image eventually evolved into a 12V electric version of that same track. Because there are wires included in this glued display model (the tracks are glued to the wooden board)... this could have been a working model (with transformer used by LEGO retailers for demonstrating the 12V system. I have seen an image of a 12V 721 LEGO Steam Locomotive running on this type of track in a TLG display at the LEGO Idea House in Billund. 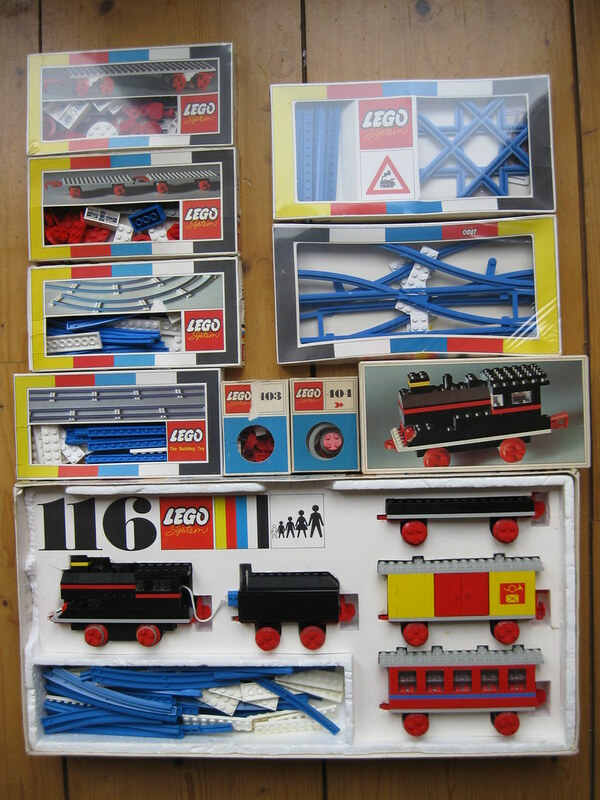 Thanks 'LEGO Historian' for all this history of early Lego trains.....very interesting. I have always wondered why the UK did not have the blue 12v trains by 1973? I thought they were released in all of Europe by 1969-1970? Both are from the 1973 catalog with "Ambulance. Built by Maria aged 5" on the front of the catalog. So I am wondering if the blue track 12v system was ever released in the UK? Thank you for all of the Trains History I have already learned so much from you! 9v system , I didn't notice that until you mentioned it, but it does look like a steam powered workshop in the lower right of that image! I recognize the regular 4x4 red 1960s era wheels, but that large wheel is puzzling? Could that be a USA/Canada only Samsonite large red gear? Even though TLG Denmark designed the (1965-73) Samsonite gears, they were never found in any European sets. Very interesting! Rail Co .... the blue track era 12V trains were never sold in Britain/Ireland/Australia. Apparently British LEGO Ltd. for some reason never sold them in those locations (they only sold the gray track 12V trains in those locations). Also, the blue track era 12V trains were not sold in USA/Canada (neither were the gray track era 12V trains). Only continental Europe had blue track era 12V trains. One irony of this is that the 1970 Japanese catalog shows a full array of blue track 12V trains as being sold in Japan starting in that year. However, these are unknown to Japanese collectors. 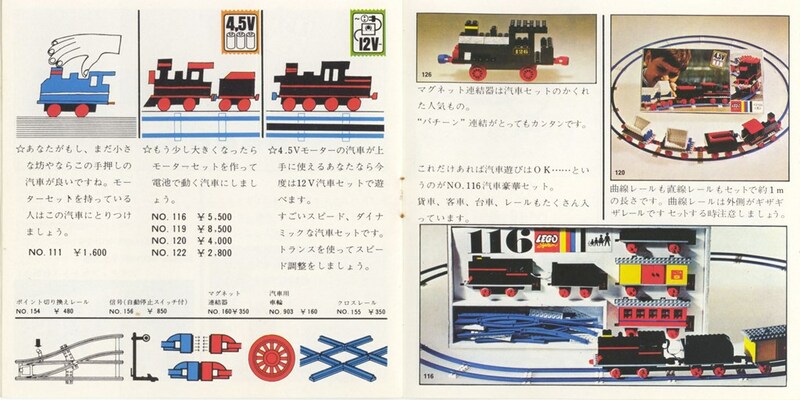 So it appears that the 1970 Japanese catalogs showing the blue track era 12V trains was printed before the Fujisho Co. (the Japanese LEGO licensee in the 1970s) may have thought the trains too expensive to sell there, and they were never exported to Japan. Epic pictures ...thanks for sharing! I was looking a little closer at my notes about the first LEGO train with motor... the 113 set that came out in Summer 1966. When the 113 set came out, it was one of the few train sets that was sold in all LEGO countries.... USA/Canada (Samsonite), Britain/Ireland/Australia (British LEGO Ltd.) and continental Europe (TLG). But one odd thing about this set was the parts count. In continental Europe, Britain/Ireland and Australia it had 344 parts. In the USA it had 402 parts and in Canada it hat 415 parts. Also the 4 pairs of printed bricks were different for some regions. Britain/Ireland and Australia had LONDON, MANCHESTER, GLASGOW, and ROYAL MAIL printed bricks, while continental Europe, USA and Canada had HAMBURG, BASEL, GENOVA and POST printed bricks. The box top shows a built train with enough track to build a partly elevated train. 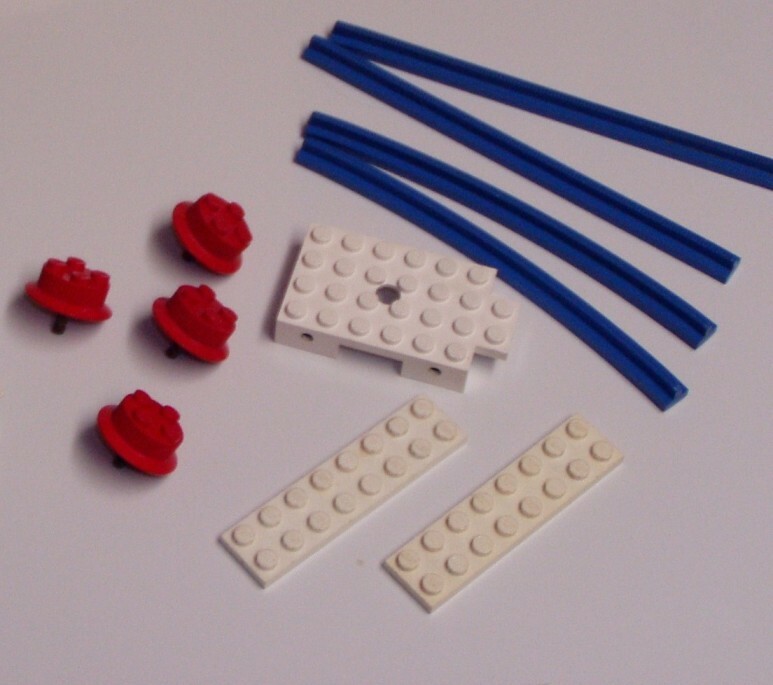 However the contents of the set don't contain all the parts necessary to finish this layout. 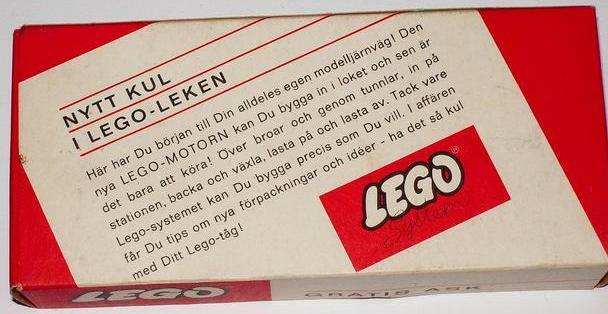 In the 1950s and 1960s LEGO was trying hard to sell spare parts packs... and sometimes not providing enough pieces to build exactly what may be on the box, was considered a way to entice you to buy the parts packs. Can you imagine the outcry today if LEGO showed images of stuff you could build but didn't put in the bricks or at least state what sets you must buy! Thanks Pizzareno! 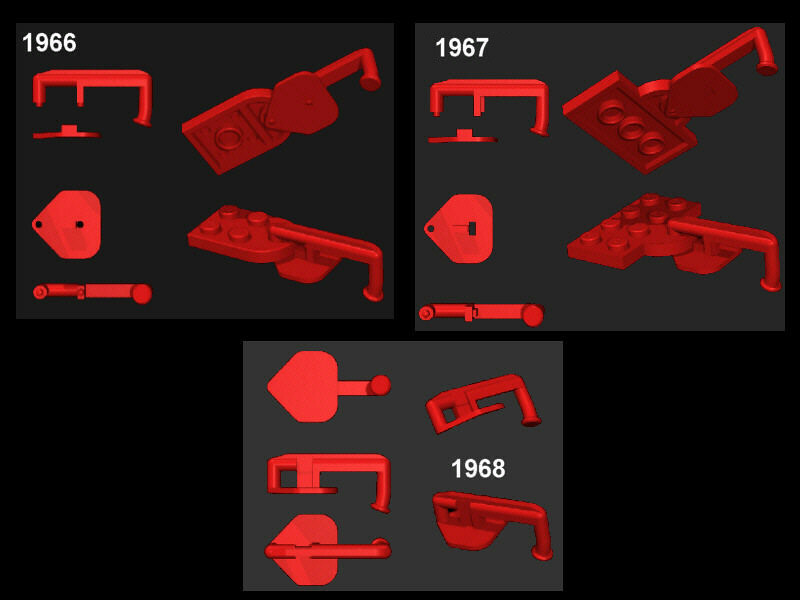 I've been amassing images and info about sets, parts and LEGO history for 8 years now! I have been in contact with the Billund Archives in Denmark as well, since I've had so many unanswered questions (not anymore!). And sometimes I give them info and images on sets that they have never seen. It's a 2 way street. But I've gotten many images from them and over 100 major collectors worldwide, that went into my 2800 page collectors guide. 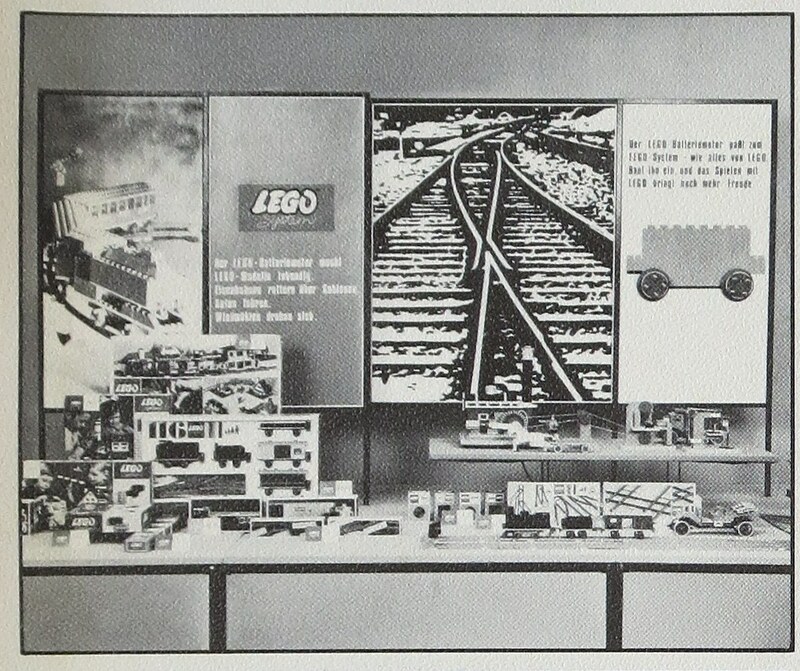 Here's an image from my collectors guide that dates 11 year before the introduction of LEGO Trains in 1966. 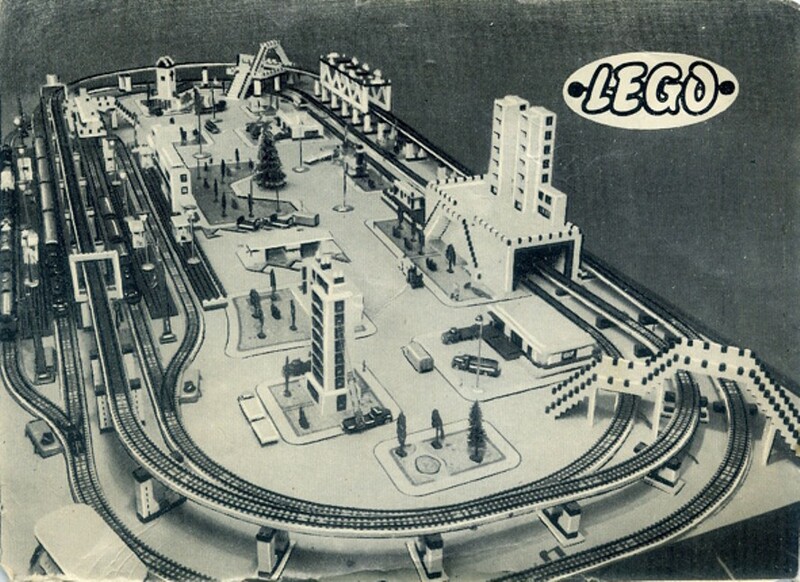 This 1955 image shows the first of the LEGO Town Plan System using..... HO Trains!! 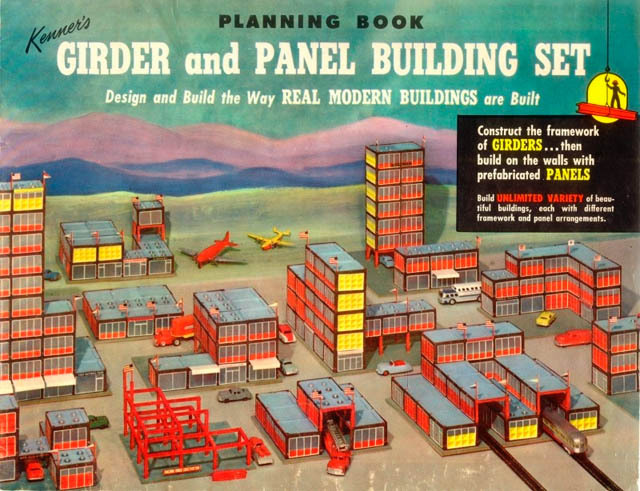 Yes... from 1955-58 TLG was promoting the use of their Town Plan System with Vollmer HO scale trains! I have a lot of very old images showing this. In the old idea books you can see the seeds of what would eventually become the gears and then technic. Here in the 1963 idea book you can see some of the "steam powered" factory equipment. Though maybe peeron has the date wrong since the top left corner does appear to show a 4.5v train with couplers... or maybe this idea book included forthcoming parts. 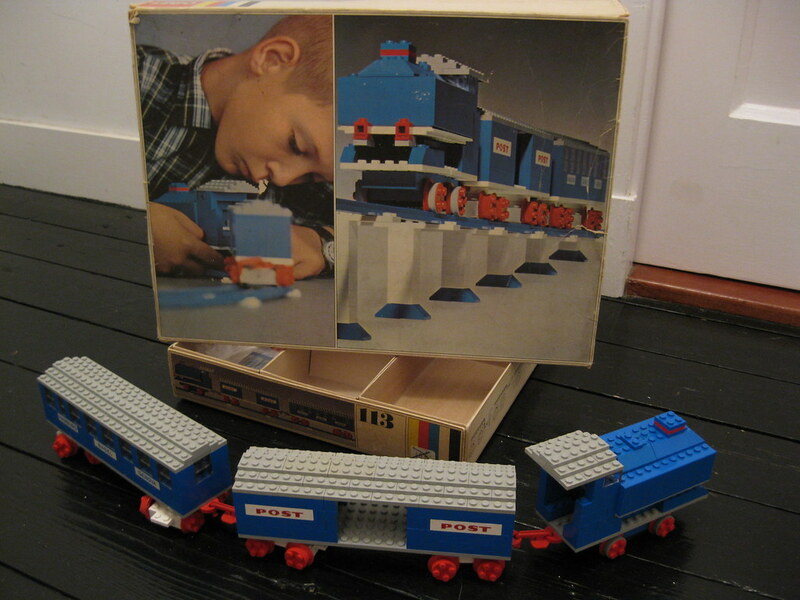 Lego had been making trains for several years before 1966. The first were simply push trains with normal wheels, but here too, the 1963 idea book shows 4 wide push trains on blue track. While these pages show examples of the standard wheel push trains p16 and p17. Though again, peeron might have the date wrong, but a few of these train models can also be found in the 1965 idea book (p6 and p11). 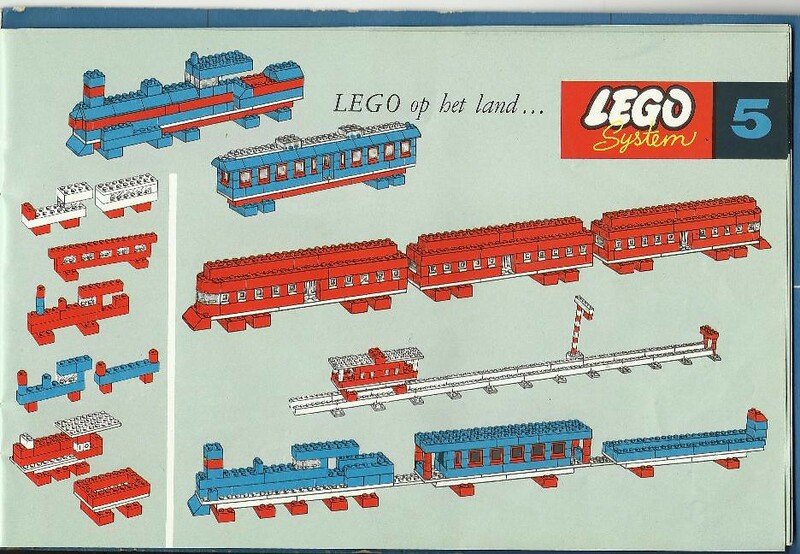 In my Unofficial LEGO Sets/Parts Collectors Guide chapter on early LEGO Idea Books, the first mention of trains was that 1955 Danish ideas booklet that shows HO Märklin Trains with LEGO scenes. The spacing of the Märklin tracks exactly fit LEGO bricks, they were compatible, from what an HO train collector friend told me. The other HO scale train system train tracks were not. The 1963 idea booklet that you referenced in Peeron actually is a (released that summer) 1966 German #238 Idea Book. 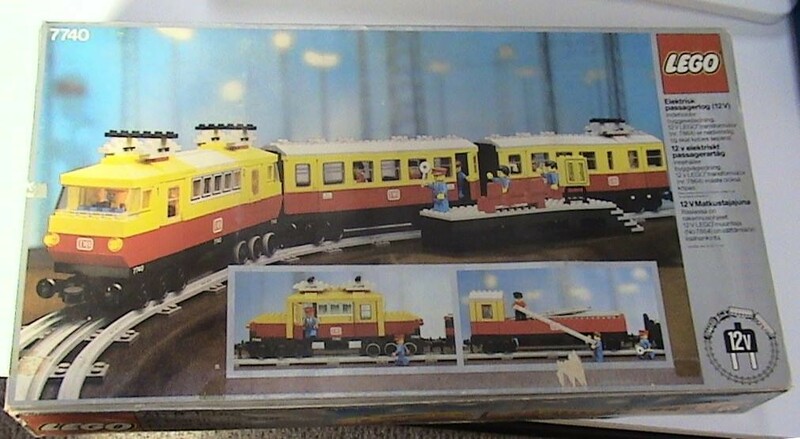 So regular LEGO trains were already in production when that booklet was released. 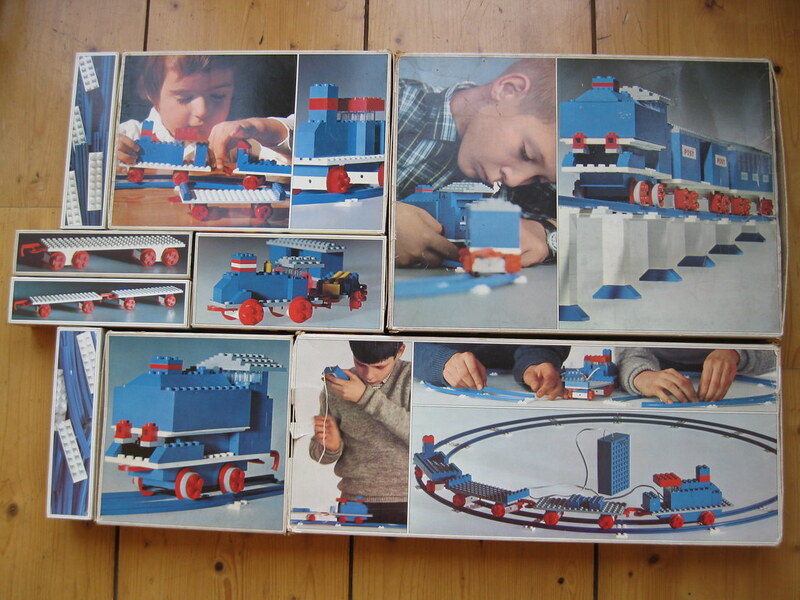 Then in March 1962, when LEGO wheels were introduced, the 238 Idea Books changed the artwork on these images, and replaced the bricks with wheels. So yes.... LEGO trains (as ideas) predate the summer 1966 introduction of the Train System... no doubt about it. when I was a youngster every pocket money i got was to buy a Lego train and tracks. still got some blue tracks and trains 4,5 V=. printed brick => "KOEK BANKET"
Nice! Thanks for all of the details. Ah, that might explain why HO trains will fit nicely on a pair of 1x tiles with two studs gap, as per this post. I think the 36 months notice was a legal requirement for toys exported to France. As manufacturing moved, the 36 months notice moved from being a sticker for the French market to a printed notice on the box itself. The 12v trains weren't sold in the USA for legal reasons - I believe the highest permissible voltage for children's toys was 9v, and I think that tapping into this market was a factor over and above general refresh and review of the existing equipment after the successful pilot of the Light and Sound System since 1986. Part of the issue will have been that the 4.5volt 1981 and 1985 trains simply weren't in the same league as the 12v trains of the respective years. 7740 and 7745 had prestige; 7720 and 7722 did not, and that was even more true of 7710 and 7715, the trains without motor. Your pics of course showed the European packaging variants, which were different from the US packaging requirements, which I know required piece counts, names etc. I obtained 7824 from a US ebayer some years ago, and to my surprise it was the normal European box with a large white label over the standard multilingual text to display the US-specific requirements. Thanks for the comments AndyB100! Until the introduction of the 9V Train System, continental Europe dominated the LEGO Train System. 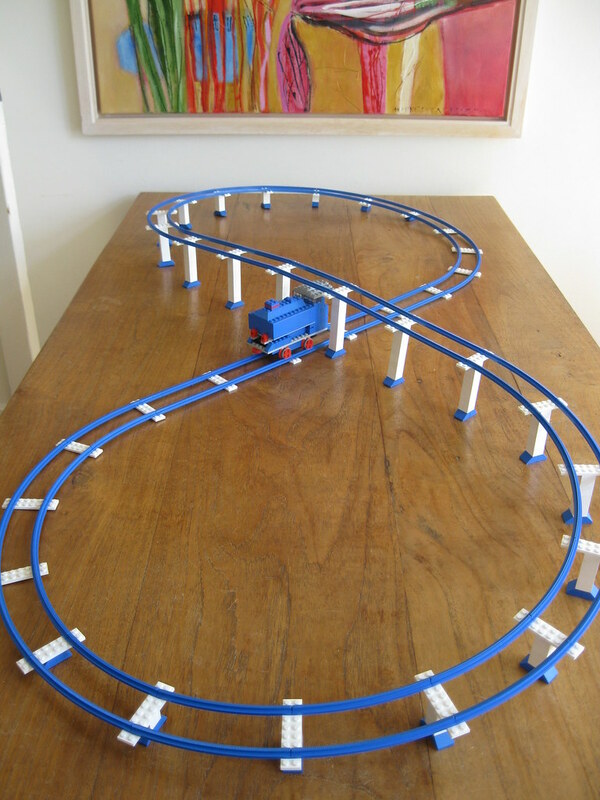 In USA/Canada LEGO blue track trains were introduced in push and 4.5V variety in 1966, just as elsewhere. However, due to the legal licensing maneuvering of the early 1970s, LEGO trains ceased sales in the USA from 1970 until 1980. 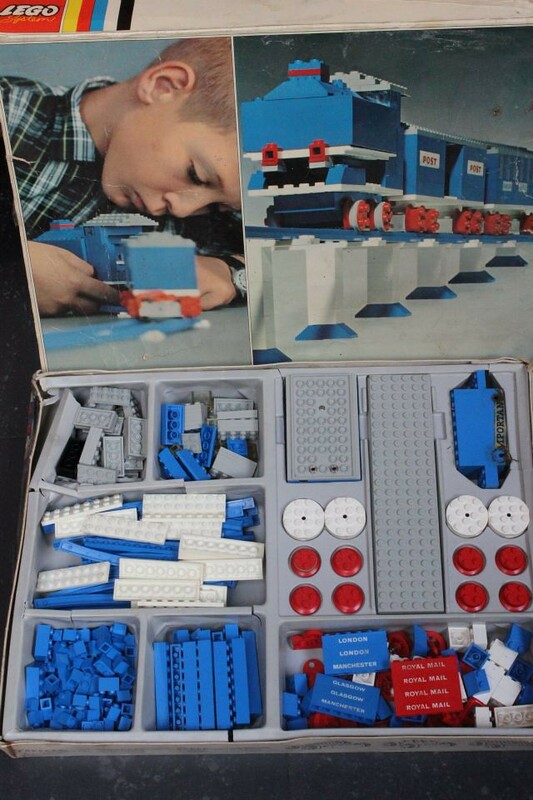 The Samsonite LEGO license in the USA was returned to TLG in 1973, and no LEGO trains returned to the USA until 1980. Even in Canada, where Samsonite was able to keep it's license, trains were discontinued from 1975 until 1980. Even in Britain, Ireland and Australia (British LEGO Ltd. as the licensee), when the 12V system was introduced in continental Europe in 1969, British LEGO Ltd. did not sell 12V trains. It was with the advent of the gray track era starting in 1980 that limited 4.5V trains were reintroduced in USA and Canada (Canada continue to produced LEGO by Samsonite until Oct. 1988), although of limited variety. Hearing that USA sets may have had stickers with piece count and other info on them is of no surprise. 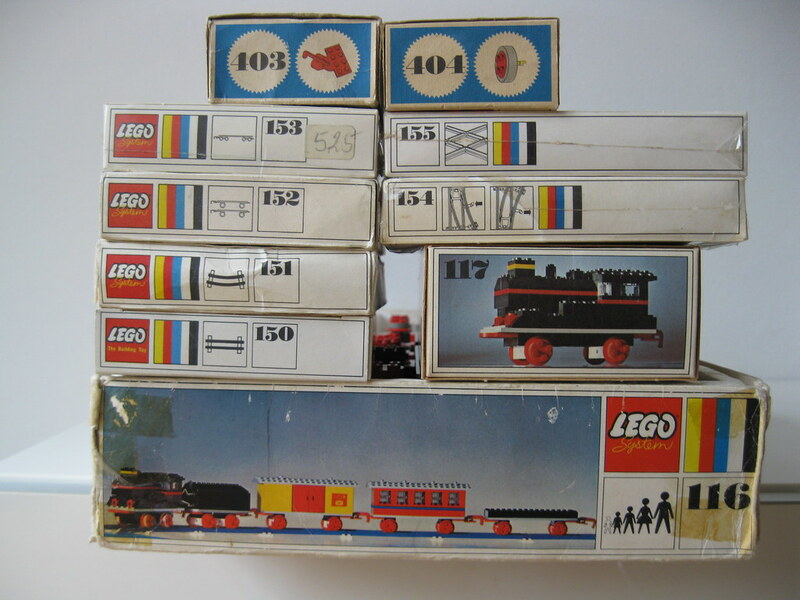 In the first half of the 1970s all Canadian LEGO 4.5V and push trains had sticker with parts counts. 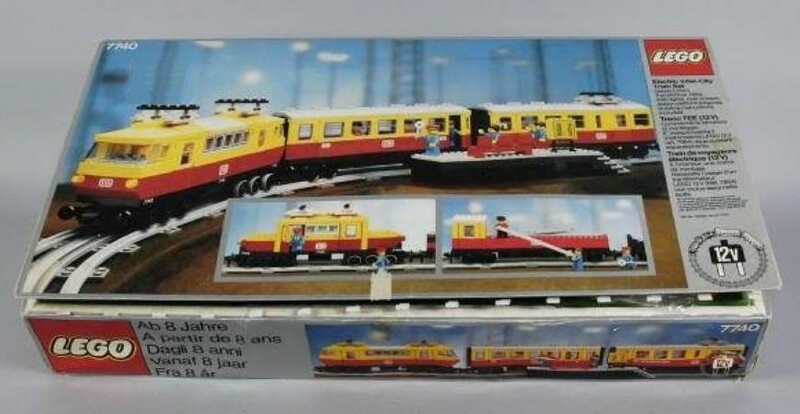 Although no 12V trains were introduced in USA/Canada in the 1980s (they finally were introduced by British LEGO Ltd. in Britain, Ireland and Australia in 1980), most items train related was exported from Denmark. One irony of the 1983 Canadian LEGO catalog is that even though no 12V trains were sold there.... the 12V 7760 Blue Shunter Locomotive was on the front cover of that years LEGO catalog (reason for that is because the same catalog cover designe was used in Europe). But until the advent of the 9V train system.... very few LEGO trains were sold in the USA and Canada... and definitely not the 12V. An interesting one regarding packaging and catalogues for you is that the normal packaging for the UK was English/French/Flemish. 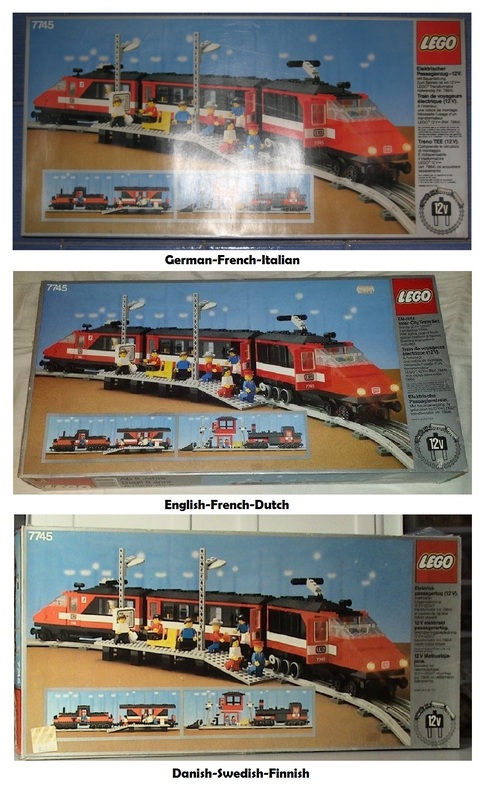 I have the exception: a 1982 trains catalogue in English/French/Italian, including the notice that 7750 was not available in any of the three countries. The 12v boxes tell us a lot about markets. UK, France and Belgium we've already discussed, but French/German/Italian will have served Germany, Switzerland and Italy in one go, and the Scandinavian group will have spoken for itself. Presumably English/French/Italian was an exception to deal with the limited market for 7750. First, thanks for sharing this to us! Second, if you need photo i have a misb Minitalia 24 box, the train, not now, because i'm in china for work. Third tell me everything a out your book, i have to buy!